An odd by-product of the nosedive in G7 vol has emerged: EM vs. G7 vol spreads are re-widening, not because risk premia in EM are rising as was the case last year – quite the opposite in fact – but because G7 options have cheapened disproportionately more (refer 1st chart). Rewards from outright vol selling are absolute, not relative quantities, yet this comparative EM – G7 vol set-up is motivating many to consider short EM FX vol plays as a complement to long carry portfolios. 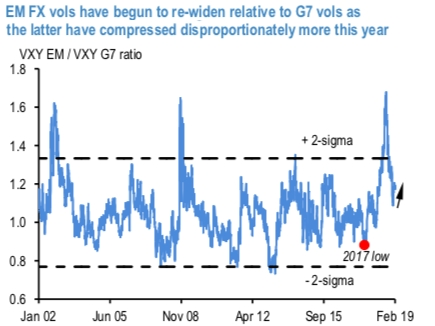 One cannot argue with a theme that is so manifestly working – 2nd chart displays that conventional high-beta EM names like TRY, MXN and KRW led the short vol league tables so far, with sizeable 1.5 – 3.0 % pt. P/Ls, in contrast to mild losses from selling AUD and NZD vol where central bank and data-driven spot gyrations were more acute. We ourselves are running short TRY and MXN vol in our model portfolio in more cautious formats than outright straddles (TRY – ratio USD put/TRY call spreads; MXN – calendar risk-reversals). Currency Strength Index: FxWirePro's hourly USD spot index is inching towards 3 levels (which is absolutely neutral) while articulating (at 13:14 GMT).